Posted on February 21, 2013 by Sarah S.
J.crew has some unique DIY denim styling ideas, including my favorite: DIY patchwork monogram and patch-pocket fading. I’m up for giving the patchwork monogram a try one of these days, but in case you aren’t so inclined to spend time on these looks, here are some great store-bought alternatives. 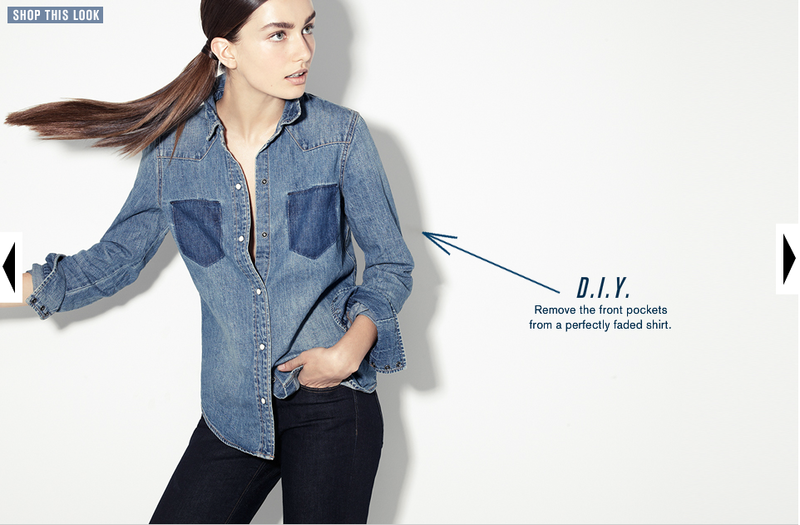 View all of J.crew’s DIY denim ideas here. Colorblock Denim Wester Top, now $39.99 at American Eagle Outfitters. 90s Denim and Gingham Top, $30 at vauxvintage on Etsy. This entry was posted in DIY & Tutorials, Style and tagged american eagle, denim, DIY, etsy, j.crew, jcrew, monogramming, patchwork. Bookmark the permalink.